Another ballpoint review?!?! This was a free gift that I received when I ordered my Lamy 2000 from Cult-Pens. This is a retractable pen that looks really smart. The model I have is a combination of a navy barrel, light grey clicker and nib cover. The plastic pen clip is located at the end of the barrel and is also incorporated in to the clicker mechanism. I have found the click mechanism feels very strong as you get a good level of feedback while the nib is exposed and retracted. The material used is a standard plastic but works really well for this price point. The grip area has grooved lines were the rest of the pen is smooth. This allows for a good gripping area. I would say this is great for the everyday pen user but I found this to cause a big issue for me. Were the the grip area ends and the nib section begins there is a sharp change in the width of the Lamy Logo. I do hold the pen pretty low down while writing so this means the grip area digs into my finger and becomes very uncomfortable for me to write with for extended periods. My fingers covers both the smooth nib area plus the line grooved grip area section. As the Lamy Logo is made from plastic it is a really light weight pen. Even with the refill loaded it is still a very light pen. With nib retracted it comes in at 13.5cm in length. With nib produced it is 13.5cm in length. At the end of the pen where the clip is it is 1.4cm wide. 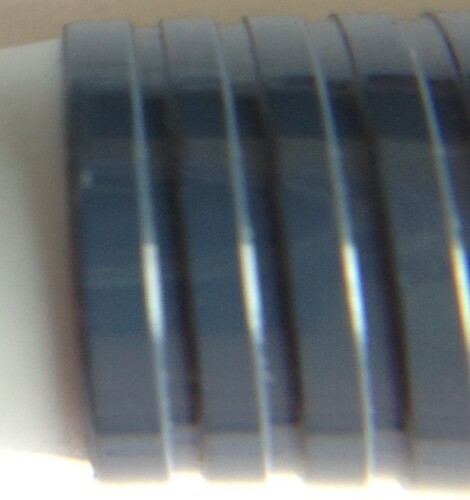 The other end of the pen is 1cm wide. The Lamy Logo takes refills. The refills used is the Lamy M16 Ball Pen Refill which comes in a Fine, Medium and Broad Nib. I have been using a medium nib refill. You have also the choice of three colours; Black, Blue and Red. Each refill costs £3.16 which is pretty costly when you consider the Logo only costs £4.00. This is a very standard medium nib. It lays down the same line with as the Caran d’Arche Goliath Refill. I would say the Lamy M16 refill is a tad bit more consistent in the depth of colour than the Caran d’Arche Goliath Refill would be. It does suffer from random bouts of pale blue tones during writing. 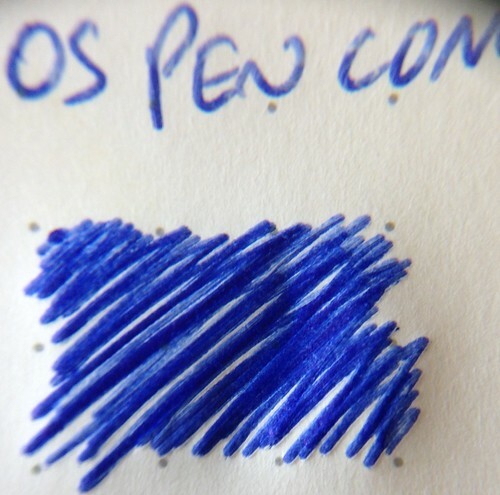 I am getting convinced this must be a common thing with Ballpoint refills as this happened with the Caran d’Ache 849 Classic I reviewed. As I received this for free I can’t really be too down on the Lamy Logo. I wouldn’t pay £4.00 for one but as of yet I haven’t come across a Ballpoint Pen that has blown me away. A common theme I am noticing is the entry barrels for ballpoints aren’t that dear but the cost of the refills are nearly the same as the barrel. How cost effective in the long this is I’m unsure. Is there one out there that you would recommend to me? If so drop me a comment below!